Please tell me I'm not the only one!!! ha ha ah! I do this sometimes! I'm not surprised!! Probably where I got it from! Well, it never had crossed my mind. But now it will. Thanks a lot!!! Yes! Cleaning with kids around has to be the most inefficient thing ever. Love your blog's tagline :) Thanks for linking this up with #findingthefunny! 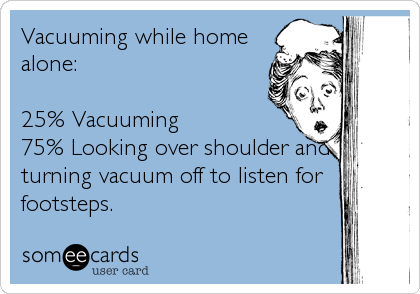 I can't stand to vacuum when home alone!